https://sep.yimg.com/ay/yhst-33477391359232/crocea-clam-tridacna-crocea-crocea-clam-cultured-9.jpgCrocea Clam - Tridacna crocea - Crocea Clam Cultured Expert Only!!! Taxonomy: Crocea Clam belongs to the Kingdom Animalia, Phylum Mollusca, Class Bivalvia, Order Veneroida, Family Tridacnidae, Genus Tridacna and Species crocea. Scientific names: The scientific name of Crocea Clam is Tridacna crocea. Other common names: Crocea Clam is also commonly known as Ultra Crocea Clam, Boring Clam and Crocus Clam. Origin or natural range: Tridacna crocea originates from the Indo-Pacific region including the Great Barrier Reef, the Solomon Islands and Vietnam. Size: Crocea Clam grows up to a size of around twenty centimeters. Color: Tridacna crocea occurs mainly in the variations and the combinations of Electric Blue, Brown, Purple, Yellow and Green colors. Aggression: Crocea Clam is non-aggressive towards the marine aquarium invertebrates. Compatibility: Tridacna crocea is reef compatible. In its natural habitat, Crocea Clam is found in groups. When Tridacna crocea perceives any danger, it tries to burrow itself in Calcareous substrates. To penetrate such substrates, Crocea Clam secretes an acidic substance which dissolves the Calcium Carbonate present in the substrates. The dissolution is accompanied by the penetration of Tridacna crocea in the substrate. To penetrate, the Byssal Muscles help facilitate the vigorous clap of the thick shell of Crocea Clam. Due to this clapping, the ridges of the shell dig into the dissolved Calcareous substrate and Tridacna crocea burrows in there to protect itself from its predators such as, Starfish and Butterfly Fish to name some. 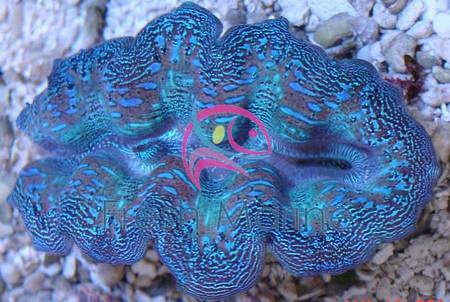 The mantle of Crocea Clam is patterned with a mixture of fluorescent colors. Tridacna crocea has a thick shell, at the posterior end of which are fine ridges resembling a file. The anterior end of the shell has thin scales. The pipe, called Siphon, receiving water incurrent contains tentacles. Tank type: To host Crocea Clam, you should have a Reef Type Marine Aquarium. Aquarium set-up: Keep corals or rocks and sand or gravel in the reef tank for Tridacna crocea to burrow itself in. Water flow in the aquarium: Crocea Clam requires moderate water flow in the marine aquarium hosting it. Crocea Clam requires high intensity lighting in the marine aquarium it inhabits. Power Compact, Daylight Fluorescent Tube and Metal Halide lighting are recommended for Tridacna crocea. Placement: Place the Crocea Clam high in your marine aquarium, on a Live Rock. Diet: Tridacna crocea is Planktivorous in feeding habit. Food content: Crocea Clam derives its nutrition mainly through photosynthesis, which is performed by Zooxanthellae, a photosynthetic algae living symbiotically within the mantle of Tridacna crocea. Crocea Clam eats Phytoplankton twice or thrice per week. Supplements: Add Iodine, Strontium, Trace Elements and Calcium to the tank water as the dietary supplements for the Tridacna crocea therein. Maintain the Calcium level between four hundred milligrams and four hundred and eighty milligrams per liter of the aquarium water. Tridacna crocea is moderately difficult to maintain. Shrimps, Angelfish, Butterfly Fish, Starfish and crabs may attack Crocea Clam. Fluctuations in the pH of your marine aquarium may give pH shock to the Tridacna crocea therein. The color brightness, the growth and the life of Crocea Clam is directly proportional to the intensity of light the clam is exposed to. Therefore, be very particular that ample light reaches to the Tridacna crocea placed in your marine aquarium.